Augustinian, built in 1258. The order's relatively late foundation and need for large space for congregations, they being a preaching order, means that their churches are usually found near, or just outside, the city walls. The chapel in the right transept was added in 1487. Internal renovation by Luigi Vanvitelli in the 18th century and an entrance doorway designed by Agostino Fantastici in 1819. The church is now used for cultural events. A large baroque and aisleless space, remodelled in 1749 by Gaspare Vanvitelli, with two pairs of altars either side, flanking the side door on one side and the door leading to the Capella Piccolomini on the other. 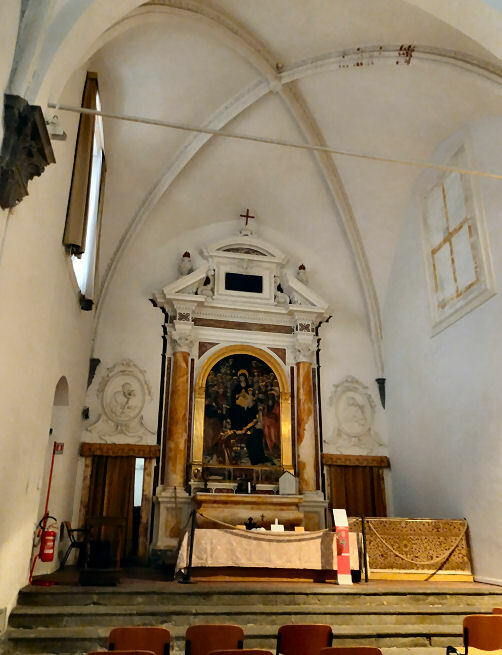 The high altar has the shrine of the Blessed Agostino Novello, a local almost-saint who organised and worked to benefit the poor and infirm from the hermitage of San Leonardo. There are some very ordinary 17th-century altarpieces, but also a Crucifixion (completed in 1506) by Perugino over the second altar on right, the Chigi, which shows the crucified Christ with the Marys and Saints Monica, Jerome, John the Baptist and Augustine, all looking pretty languid and relaxed. By the side door is the altar of San Silvestro, which has a Baptism of Constantine (1586/7) by Francesco Vanni which is impressive, if somewhat frantic. The Capella Piccolomini in the quite large former chapter house of the convent, which was converted into a chapel in 1597 by Archbishop Ascanio Piccolomini, which is when the frescos by Ambrogio Lorenzetti mentioned below would have been whitewashed over. There is a crowded Adoration of the Magi from 1530 by Sodoma over the altar. The youth in profile to the left of Madonna is said to be a self-portrait. The highlight lunette fresco opposite is a Maestà by Ambrogio Lorenzetti (see above) which was discovered during work in 1943 when the Sodoma altarpiece was being moved for safety from bombing. Following the discovery the altar was repositioned into the opposite wall. The lunette fresco is all that remains of a seemingly-special cycle by Ambrogio, much admired by Ghiberti, devoted to the life of Saint Catherine of Alexandria. Long after the whitewashing mentioned above renovation in the 18th century largely destroyed the the frescoed walls. There have been many theories expounded to explain its odd selection of sometimes hard-to-identify saints. A recent, and quite convincing one, relates the painting to disputes amongst Augustinians at the time of its painting. A meeting of the Order's Chapter was convened in this very chapel in 1338. 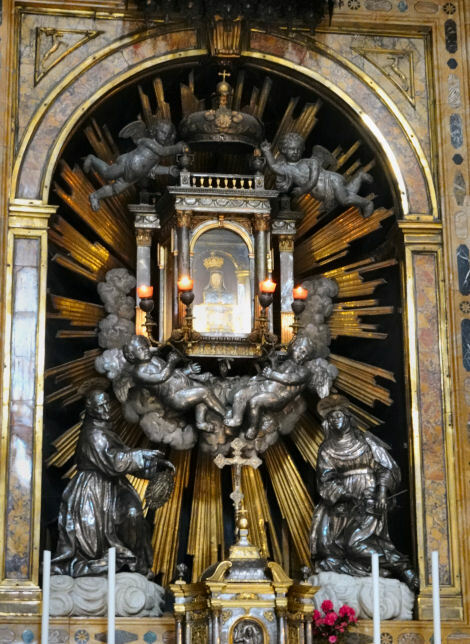 It does contain arguably the most shocked-looking Baby in trecento art, as various female saints present him with the bodily parts removed during their martyrdoms. Recent restoration has identified a layer underneath thought to be an earlier fresco by earler (pre-Duccio period) Sienese hands. The second (Bichi) chapel to right of high altar has two lunette medallions of the Tiburtine and Erythraean sibyls by Luca Signorelli and monochrome frescoes of the Birth of the Virgin and the Nativity by Francesco di Giorgio and collaborators, all painted c.1489/94, found under whitewash during restoration work in the 1970s. 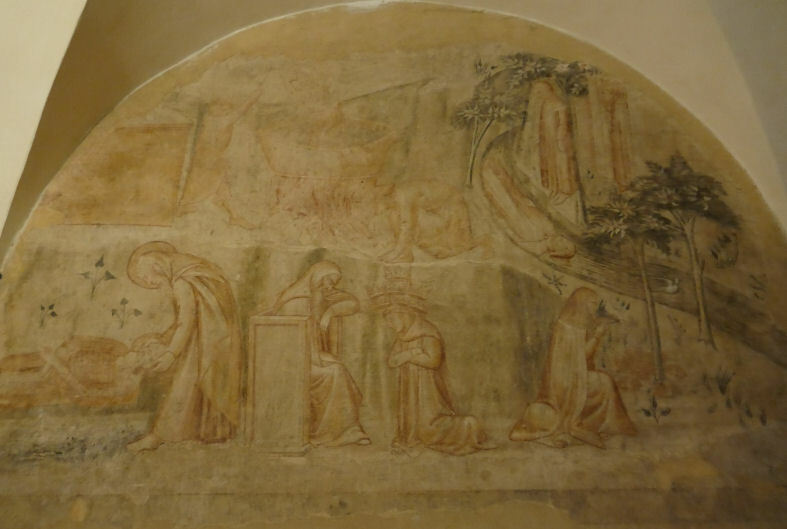 The sacristy chapel has fragments of frescoes of the Infancy of Christ and saints by Paolo di Giovanni Fei from c.1373/75, his earliest known work. Jacopo della Quercia is said to have been buried here. Two paintings once in the Capella Piccolomini here: one of the many odd versions of the Massacre of the Innocents (1482) by Matteo di Giovanni is now in the Capella della Madonna in the Santa Maria della Scala Ospedale. Fragments of its lunette are in Esztergom and a private collection. The fine Blessed Agostino Novello and Four of his Miracles (c.1330) by Simone Martini (see right) is now in the Pinacoteca and is one of only three works by him remaining in Siena. It was painted to be placed on the subject's tomb here, hence the unusual polygonal top. The four flanking scenes showing Agostino's healing miracles, with him swooping in to save the victims of accidents, mostly children, are probably the work of assistants. The Bichi altarpiece, painted to go in the family chapel mentioned above by Luca Signorelli was disassembled and dispersed in the mid 18th century. It was commissioned in memory of Cristoforo Bellandi, the deceased son-in-law of Antonio Bichi. The central wooden statue of Saint Christopher by Francesco di Giorgio is in the Louvre. 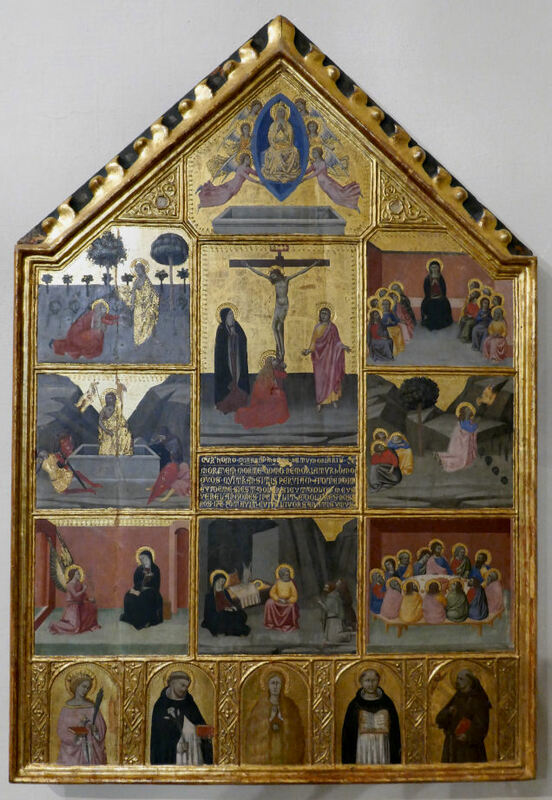 The large flanking panels depicting Saints Jerome, Catherine of Siena and Mary Magdalen on one side, and Saints Francis, Augustine and Catherine of Alexandria on the other, are now in Toledo and Berlin, with predella panels in Dublin and Scotland. These are the times publicised, but I never found the church open on a visit in 2016 and only finally got in during the big Ambrogio Lorenzetti exhibition of 2017/18 when the church was specially opened. The attendant said that when the exhibition finishes the access will return to being very rare. It was never open when I (frequently) walked past in April 2019. Small and aisleless with a nice mix of rough brick walls and smooth pilasters and arches creating five shallow bays each side of the nave. A plain stone walled apse with a shallow altar bay each side, with frescoes. Modern stained glass in the thin clerestory windows. 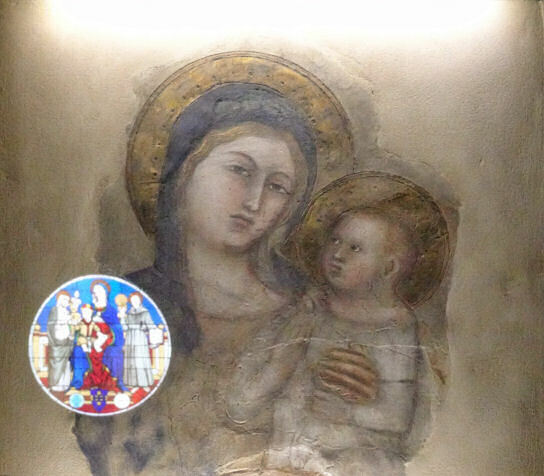 On the right a Saint Anne with the Madonna and Child fresco, possibly by Martino di Bartolomeo, from the early 15th century and discovered during restoration in 1959. Opposite, in the second bay on the left, there is a more damaged remainder of a representation of architecture with Jesus and Seraphs in the lunette and San Bernardino on the right niche wall. The label describes the frescoes as Sassettiana. There are a couple of fragments on the wall above too. The Glory of Saint Andrew by Giuseppe Nicola Nasini is to the right in the last bay on the right, and there's a fresco panel of Beata Aldobrandesca Ponsi by Apollonio Nasini (his son) in the third on the right. Also by the latter is a matching fresco opposite of Sant'Alberto da Chiatina 1756. One of Siena's patron saints. He's a 3rd-century saint, so the legend that he was imprisoned in the tower to the right of this 16th-century church, admittedly built on the site of an older church, is hard to accept. The saint is depicted in the stained glass window in the oculus above the door, the high altarpiece of 1617 by Rustichino and in the fresco fragments on the left wall attributed to Priamo della Quercia, the brother of sculptor Jacopo. The famed Annunciation with Saints Ansanus and Massimo of 1333 by Simone Martini and Lippo Memmi, his brother-in-law, painted for the altar of Saint Ansanus in the Duomo, was moved here towards the end of the 16th century when that altar was remodelled. It remained here until went to the Uffizi in 1799. 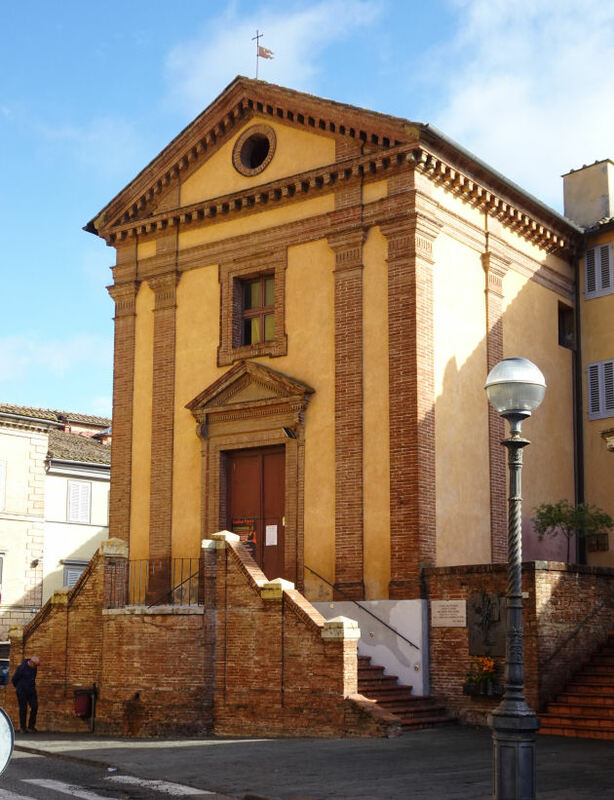 The original church dates to 1680, but the current church was built in the late 19th century by the Blessed Savina Petrilli for the Order of the Sisters of the Poor of St. Catherine of Siena, which she founded in 1873. Building began in 1884 to neo-renaissance designs by Agenore Socini and was completed in 1901. Nave and aisles separated by wide pillared arches supporting a high gallery. Aisle walls utterly plain with altars at the aisle ends flanking a shallow five-sided decorated apse. Modern panels. The decoration was overseen by Alessandro Franchi, responsible for Saint Joseph on the back wall of the left aisle, the Visitation in the apse and the Stigmata of Saint Catherine of Siena on the back wall of the right aisle, the latter carried out in collaboration with his wife Luisa Mussini (the daughter of painter Luigi Mussini, who was Franchi's tutor) she being also responsible for the Saint Anthony of Padua in the chapel named for him. On the altar a Madonna and Child by Luca di Tommè. Under the altar are the remains of Savina Petrilli (1851-1923) she being one of the 31 “saints, beatified, and servants of God” controversially mummified between 1975 and 2008. Controversial also for the fact that of the team of the embalmers only one was still alive in 2014 when the issue was reported, the others having died of various tumours and cancers, likely side effects of the toxic chemicals used in their work. 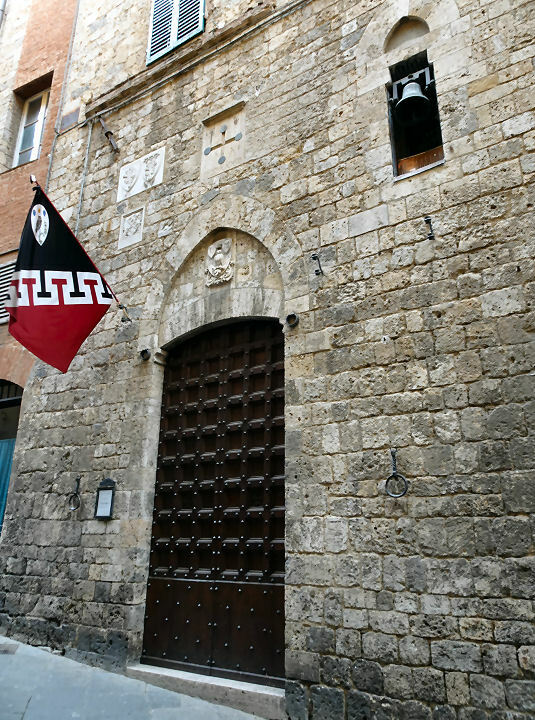 In the late 17th century locals from the Contrada della Tartuca (Turtle), many of them sculptors and masons, acquired property from the Augustinians. Construction of an oratory began in 1682, to a Baroque design by Jacomo Franchini. with the church completed in 1685. Much work by the Mazzuoli family, and some by the Nasini. Giovanni Antonio Mazzuoli was responsible for the interior sculptural decoration and the main altar with its bas-relief of the Apparition of the Virgin to Saint Anthony of Padua. The high altarpiece depicts The Miracle of Saint Anthony Restoring an Amputated Leg. The same miracle is depicted in inlaid marble mosaic in the floor by Leopoldo Maccari from 1891. 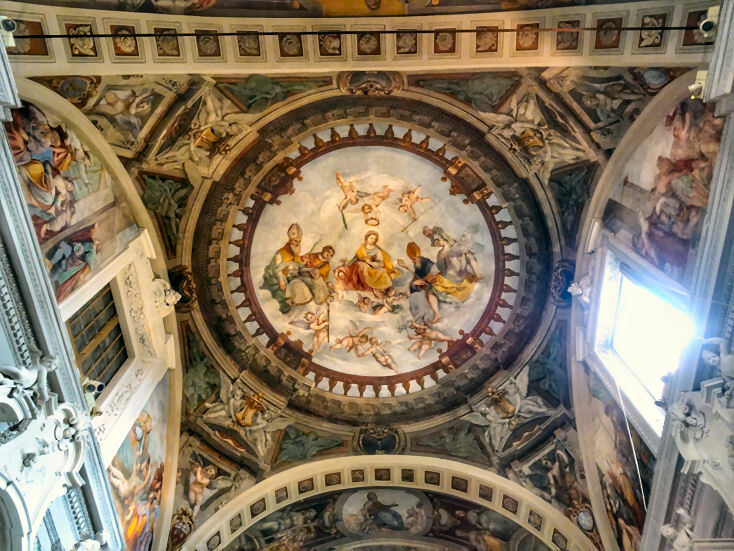 The cupola has frescoes depicting Saint Anthony in Glory by Vincenzo Dei. The side altars, built in the late 1700s, are the work of local sculptor Gaspero Fineschi and stucco artist Bernardino Cremoni. Four oval paintings of 1685-6 - The Saint Jerome and the Angel is attributed to Giuseppe Nicola Nasini, the Martyrdom of St Bartholomew is by Antonio Nasini (Giuseppe's brother), Saint Sebastian healed by Saint Irene and St Ansano Baptizes the First Christians of Siena are by Annibale Mazzuoli. Saint Anthony Preaches to Fishes (1697) by Annibale Mazzuoli; a stucco bas-relief of The Virgin offers her Baby Jesus to St Antonio, by Giovanni Antonio Mazzuoli (1685); a wooden altarpiece with Scenes in the Life of Saint Anthony by Antonio Manetti and Angelo Barbetti (1831-1832); a Madonna and Child, by Francesco Mazzuoli (1836). 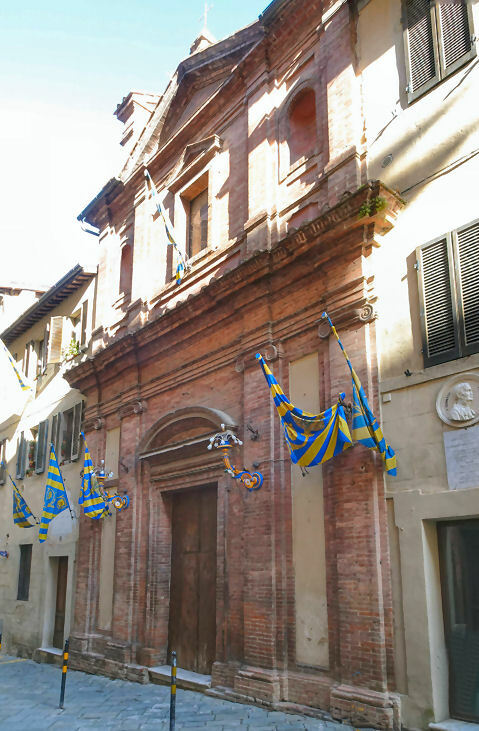 The Contrada Priora della Civetta (owl) was the last contrada to build its own oratory, they having previously used an altar in the church of San Cristoforo, just up the street. Built on the site of a shop shop, on the ground floor of a medieval palace, which was bought by the Contrada in 1932. By 1934 the façade and entrance were finished, and in 1936 the marble altar. Financial problems and the war prevented completion, until the Oratory was finally opened for worship in 1945. Major rebuilding in 1973 when the interior plasterwork was removed, painted in white and dark horizontal stripes in a Sienese style, returning the walls to brick and stone. An 18th-century painting of Saint Antony of Padua by Galgano Perpignani, and a 17th-century Madonna and Child, San Giovannino and San Carlo Borromeo with San Luigi Gonzaga by Vincenzo Rustici, given to the Contrada by Count Guido Chigi Saracini. 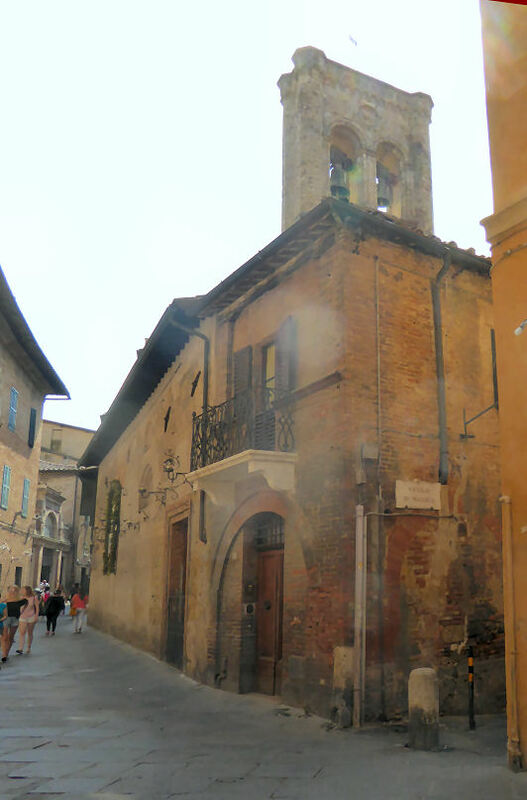 The house where she was born, it became a sanctuary devoted to her memory after being bought by the comune in 1466. 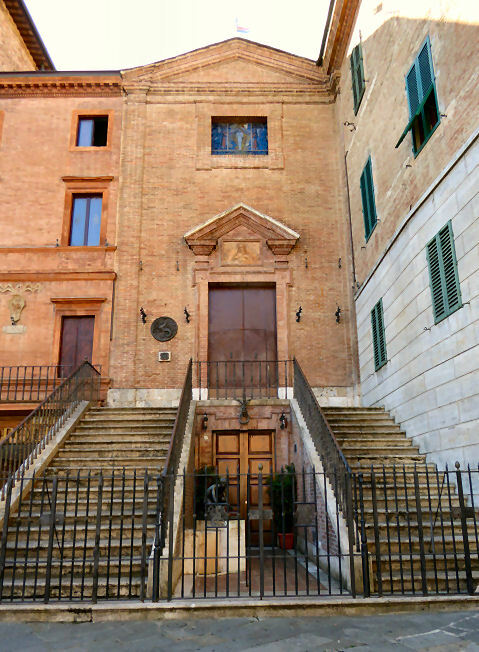 Entrance is through a loggia of 1941 (see right) down some stairs into a smaller loggia of 1533, possibly by Peruzzi or Giovanni Battista Pelori, a follower. 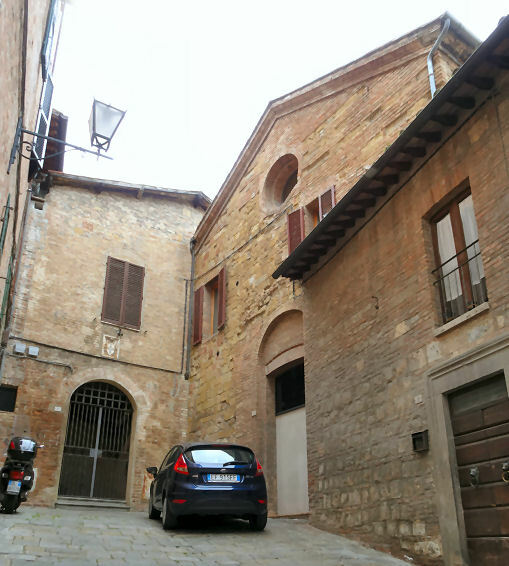 To the left here is the Oratorio della Cucina which was the family kitchen converted into an oratory in the 5th and 16th centuries, with a flat coffered ceiling by Bastiano di Girolamo completed in the late 16th century (see below right). The art is from the same century and mostly subtly mannerist. Over the entrance is Christ Giving Saint Catherine of Siena a Divine Heart by Francesco Vanni from 1585. The altarpiece is by Bernardino Fungai. The wooden stalls around the wall date from 1518 and 1555 and the lovely polychrome majolica tile pavement is from the same century. The fresco of the Mystic Marriage of St Catherine of 1578/9 is by Bartolomeo Neroni, completed by Arcangelo Salimbeni. The frantic Conversion of those Condemned to Death of 1578/80 is by Lattanzio Bonastri, who had studied in Rome with El Greco. Saint Catherine of Siena Curing a Possessed Woman from 1587 is an early work by Pietro Sorri. Opposite the oratory is the Church of the Crocifisso (see further below right) aisleless, baroque, or borderline rococo, built in 1623 to house the (late 12th century Pisan) Crucifix in front of which Saint Catherine received the stigmata in Pisa on the 1st of April 1375 in the church of Santa Cristina. It is kept over the high altar in a cupboard decorated by il Riccio (Bartolome Neroni), with panels depicting Saint Catherine (on the left) and Saint Jerome. Flanking it in the apse are scenes from the life by Giuseppe Nicola Nasini. In here are lots more 17th and 18th century paintings of Saint Catherine's dealings with the Pope and sundry miracles and ecstasies. 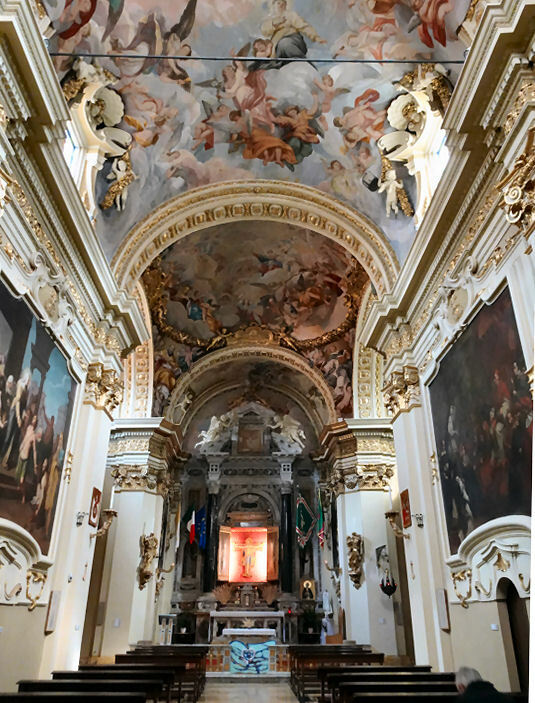 Over the right transept altar is an altarpiece by Sebastiano Conca of Saint Catherine before Pope Gregory XI and in the north transept a very baroque The Virgin welcomes Saint Catherine introducing her to Jesus of 1636 by Rutilio Manetti and his son Domenico. The ceiling is all frescoed including, in the cross vault of The Glorification of Saint Catherine 1701-3 by Giuseppe Nicola Nasini. Downstairs is the Camera della Santa, the saint's bedroom turned into an oratory after 1541. From 1550-1623 it housed the Crucifix now upstairs in the Church of the Crocifissoo. The oratory was frescoed in 1893-6 by Alessandro Franchi, from Prato, and Gaetano Marinelli, from Siena, in a style that looks it. Over the altar is a small painting from the early 16th century of Saint Catherine Receiving the Stigmata by Girolamo di Benvenuto. 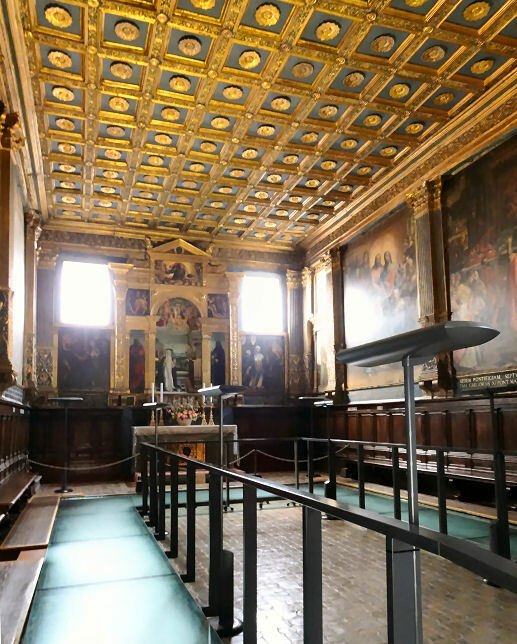 Through the metal doors at the back can be seen the room called the cubiculum, where various mystical experiences were said to have happened, with a cabinet of relics and a modern sculpture by Pietro Reposo. 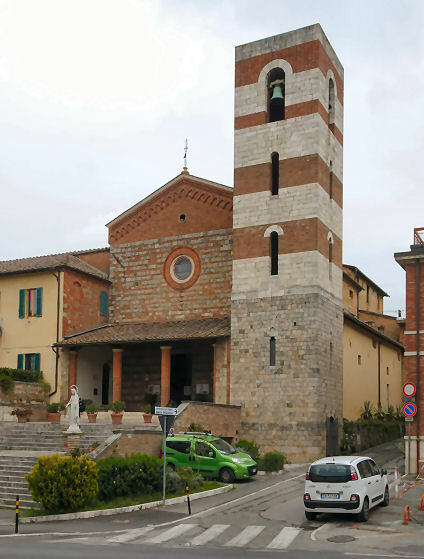 To the right outside the Camera are steep stairs down to the Oratorio della Tintoria or Santa Caterina in Fontebranda, (see below) built in 1465 on the site of a dyer's workshop (tintoria). It is not part of the visit as it is now the contrada church. I've read that yhere's a polychrome wooden statue of the saint by Neroccio di Bartolomeo dei Landi (1475), frescoes of five angels by Sodoma and scenes from the life by Girolamo del Pacchia, Vincenzo Tamagni, Giacomo Pacchiarotti and Ventura Salimbeni. Dedicated to Saint Catherine of Siena this church was founded in 1479 long being the church of the nuns of Santa Caterina del Paradiso, from which the church got its name. This original church was rebuilt 1620-26 as we see it today, with more s#work after a fire in 1693/4. 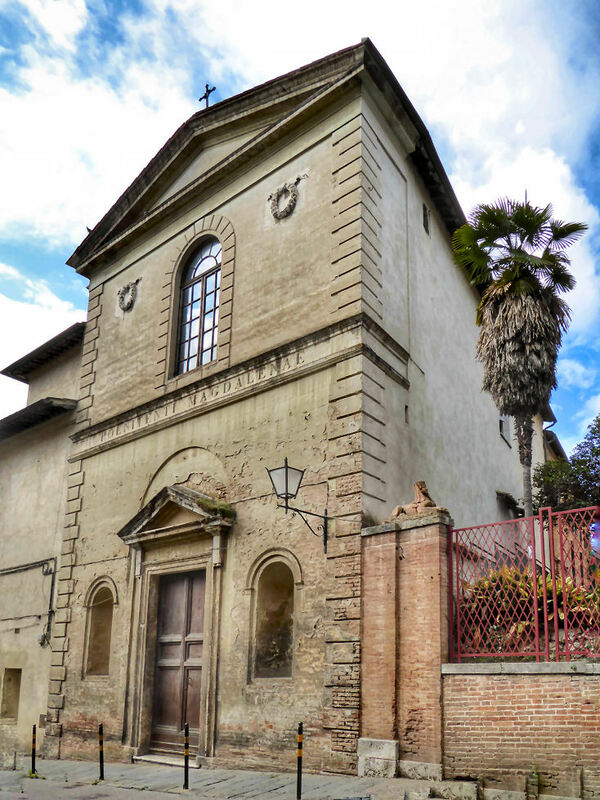 In 1787 the church became the oratory of the Contrada del Drago when it was given to them by the Grand Duke of Tuscany, Pietro Leopoldo and now houses the contrada's museum. Baroque with a single nave, three bays and a deep apse. On the marble high altar by the Mazzuoli workshop (1694) there is a bust of Saint Catherine of Siena in polychrome terracotta by Lorenzo di Mariano, known as Marrina of 1517 or 1521/24. Behind is a Pietà with Saints by Vincenzo and Francesco Rustici from 1613. Also here is the venerated Madonna della Tegola, painted by an unknown artist of the 17th century on a tile, commemorating the apparition of the Virgin to a nun. The image is evidently visibly inspired by the Madonna della Quercia in Viterbo. On the side altars to the right and left, the Virgin and Saints Mary Magdalene and Catherine of Alexandria (three paintings?) respectively with the image of Saint Dominic in Soriano by Domenico Manetti (1648-9 ) and the Mystic Marriage of Saint Catherine of Siena by Raffaello Vanni (1650). On the right wall is a polychrome terracotta Annunciation by Marrina which, like his bust of Saint Catherine of Siena, dates back to the original church. 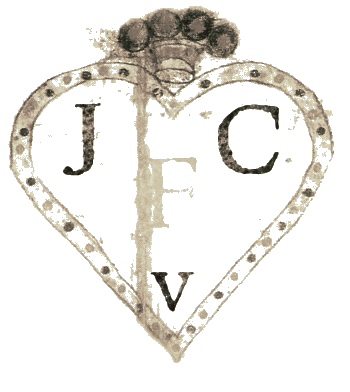 Famed Sienese restorer and forger J.F. Joni had his first solo studio next to this church. Small, pale baroque, white stucco with dull gilding and aisleless with a pair of side altars. There's a large barrel vaulted organ gallery over the entrance. Over the left side altar a carved Crucifix with painted staffage. Over the right one 18th-century stucco angels and putti surround an old icon-like painting of a crowned Virgin. The barrel vaulted ceiling and lunettes over side chapels are frescoed, with a trompe l'oeil balustraded dome in the centre. These 17th century vault frescoes are the work of Sebastiano Foli and Francesco Bertini. 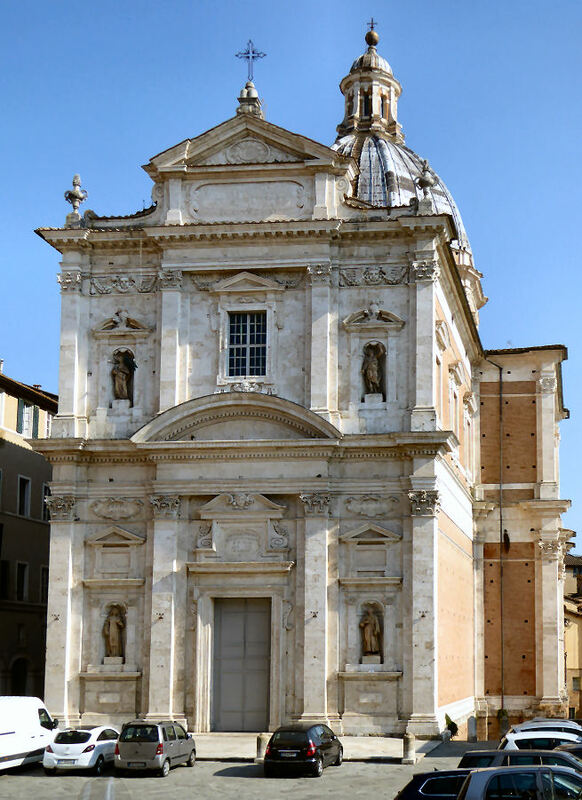 The shallow baroquely- gilded rectangular apse has grills either side and a high altarpiece of the Martyrdom of St Lucy by Francesco Vanni of 1606. Flanking the apse are 15th-century polychrome statues of Saint Lucy attributed to Francesco di Giorgio Martini and Saint Nicholas by a follower of Giovanni di Stefano. Now attached to the wall behind a glass panel to the left of the apse is a small panel of Saint Nicholas of Bari Saves Girolamo Biringucci From Torture by an unknown Sienese artist, from 1496, action-packed and looking very much like a panel from a comic strip. 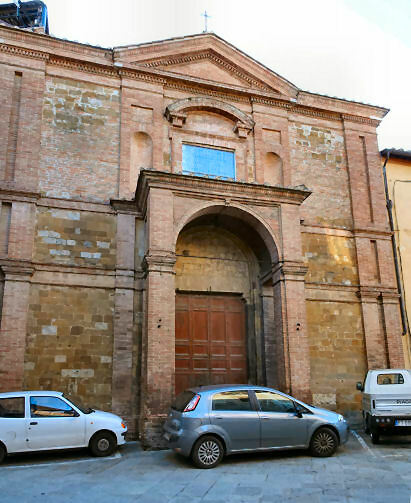 Built from from 1470-1472 for Giovanni Cinughi, the first Bishop of Pienza, whose coat of arms can be seen on the façade, but who didn't live to see the church completed. It was built possibly to a design by Francesco di Giorgio, possibly carried out by his pupil Bastiano di Corso, a Sienese-born architect, painter, sculptor and civil and military engineer. Or maybe Lorenzo di Pietro (Il Vecchietta) a painter and sculptor and also a pupil of Francesco di Giorgio. 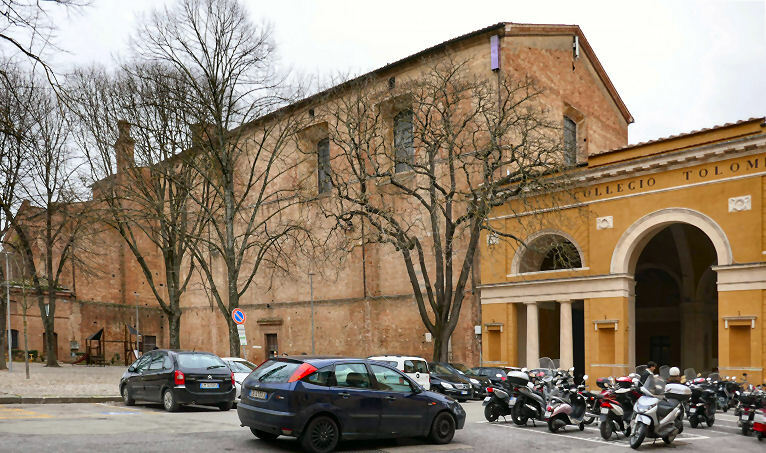 It was built as part of the convent of Sant'Egidio (the Cappuccine Sisters), demolished by the first decade of the 20th century for the construction of the Piazza Umberto I (previously called the Piazza delle Cappuccine, now officially called Piazza Giacomo Matteotti, or Piazza della Posta by locals) leaving only the church. The church has been 'temporarily' closed for restoration for many years, but see below. Barest church ever (see below right). Tall with white-washed walls and ceiling divided into two cross-vaulted squares. Two plain windows high on left wall, with two painted ones on the wall opposite. The high altar is flanked by plaster portrait ovals. 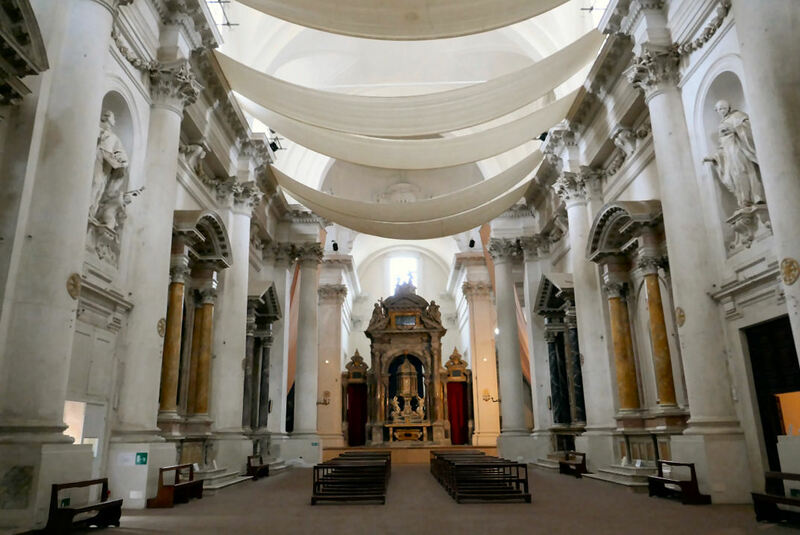 The Madonna della Neve high altarpiece by Matteo di Giovanni (usually now in the Pinacoteca) has been returned here for the duration, see below. Good to see in situ but a light would have been nice. 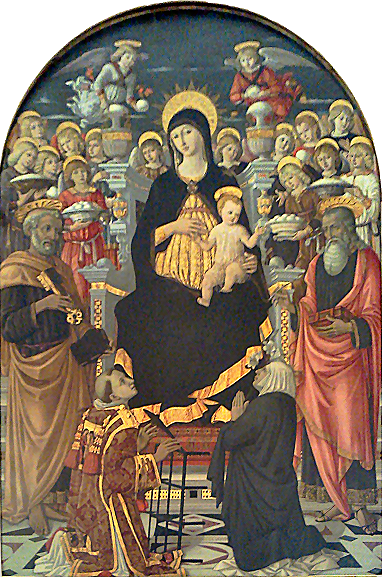 The high altarpiece, echoed in the curves of the church's vaulting, was the Madonna della Neve of 1477 by Matteo di Giovanni (now in the Pinacoteca) (see right) commissioned by the Cinughi's heirs. It features cherubs making snowballs and angels with bowls and amphorae of snow. 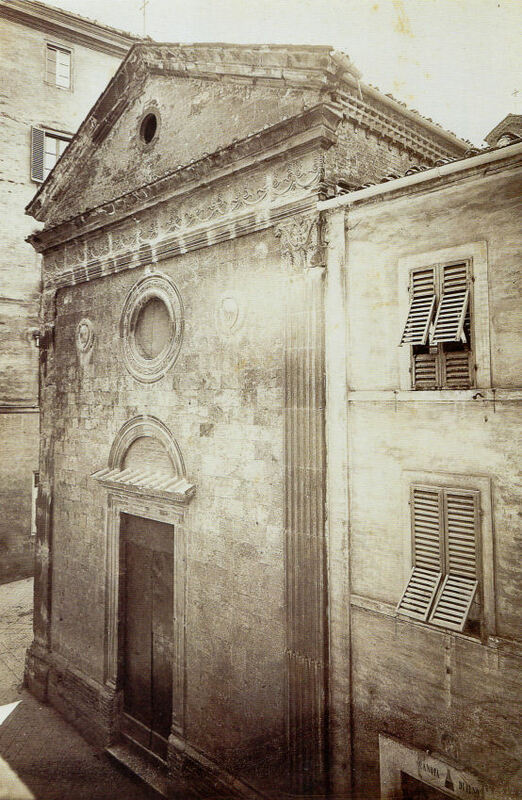 It was originally in the (now demolished) monastery of Sant'Egidio. The legend of the origins of Santa Maria Maggiore in Rome is depicted in the predella - a miraculous fall of snow marked the outline of the church. Halfway down the right wall was the Messa di San Cerbone of 1630 by Rutilo Manetti, but it's not there now. Built 1482/84 to Renaissance-style designs by Francesco di Cristoforo Fedeli from Como to celebrate the victory of Siena over the Florentines in the Battle of Poggio Imperiale fought in Poggibonsi on September 7, 1479. The former Porta de Pescaja, also known as Porta Fontegiusta, was a city gate, sited where the apse is now. It was walled up as Siena tried to limit access to the city during times of conflict. The facade remains brick. The doorway (1489) is the work of Urbano di Cortona, with a bas-relief of the Madonna and Child with Angels above attributed to Giovanni di Stefano. Almost square, as space was limited, what with the church being built up against the city wall. A nave and two aisles, supported by two columns each side, so with nine cross-ribbed square vaults. On the left wall is a fresco of The Sibyl Announcing the Birth of Christ to the Emperor Augustus once attributed to architect Baldassare Peruzzi (who lived nearby) but now thought to be a work of Daniele da Volterra, or both of them. The marble high altar (1509-17) is attributed to Lorenzo di Mariano, called il Marrina. In the tabernacle is the miracle-working Madonna di Fontegiusta by Lippo Vanni (see right) originally part of a fresco from the portico of the customs house. The large lunette fresco above of The Assumption (1515) is by Girolamo di Benvenuto, with an Annunciation in the frieze below and frescoes flanking the tabernacle depicting the Birth of the Virgin and The Madonna in Glory /Death of the Virgin (1600) by Ventura Salimbeni. To the right of the altar is a painting of The Blessed Ambrogio Sansedoni asking protection of the city of Siena from the Virgin (1590), by Francesco Vanni. On the middle of the right wall of the nave is a Coronation of the Virgin with Four Saints altarpiece by Bernardino Fungai (1508-1512). The sacristy has a small museum dedicated to memorabilia, including a whalebone said to have belonged to Christopher Columbus while he was, possibly, a student at the University of Siena. Built from 1595 and consecrated in 1611, with rare-for-Siena ornate baroque façade of 1604, to designs by Flaminio del Turco, which were said to have been based on counter-reformation principles. The dome was designed by Don Giovanni de' Medici, the illegitimate son of Cosimo I. The church is named for the miraculous bust of the Madonna that it was built to house. Its power is said to derive from it having been on the facade of the home of Provenzano Salviani, or at least a house nearby. He being the leader of the Sienese army at its famous victory over Florence at the Battle of Montaperti in 1260. The miracle took place on the 2nd of July 1594 when the bust is said to have cured a man with diseased limbs and/or 'defended itself from the insults of a soldier'. Other reports say that the bust was destroyed and the (occupying Spanish) soldier responsible then repented, or died. The faithful remain unperturbed by it having been found to date to two hundred years after the battle. The Palio horse race held on July 2nd (the date of the miracle) has been run in the statue's honour since its creation in 1656. It's somewhat ironic that the church built to house this relic related to the Sienese victory over the Florentines was one of the first major building projects after the conquest of the city by Florence. White walled with a short nave with one buff marble altar each side. Very inlaid marble altars at the ends of the transept arms. The left one has a Crucifixion sculpture group and the right a populated Adoration of with an inset Annunciation. 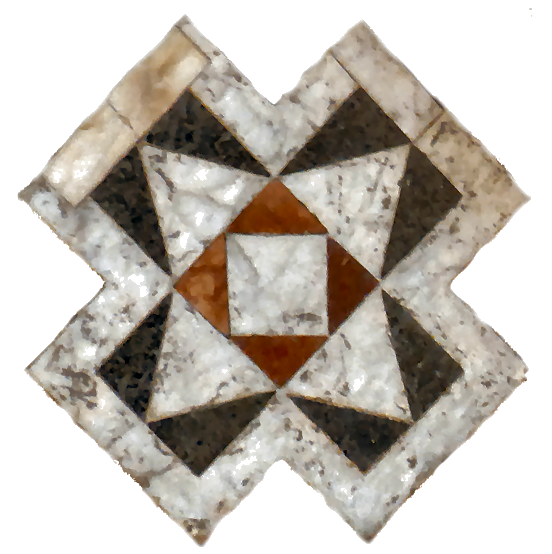 The domed crossing has a marble-inlaid floor with the Medici family insignia, they being the conquering Grand Dukes of Tuscany when the church was being built. 17th century altarpieces by Bernardino Mei (west wall) and Rutilio Manetti (first south altar). Flaminio del Turco is also credited with the design of the high altar on which the miraculous 15th century terracotta Madonna del Provenzano (see below, explained above) sits. 8.30 - 12.00 & 16.00 - 17.30. Closed Monday afternoon. The complex passed to the nuns of Maddalena in 1539 who rebuilt, entrusting the work on the church to Antonio Maria Lari, called Tozzo. Much rebuilding over the centuries with the interior completely redone between 1715 and 1729 with late baroque stucco work. The neoclassical façade was built in 1839 to a design by the wonderfully-named Sienese architect Agostino Fantastici (Augustine Fantastic) who also worked on Sant'Agostino, Santa Marta and San Giuseppe, all nearby. The high altarpiece is Saint Mary Magdalene listening to the preaching of Christ of Raffaello Vanni. 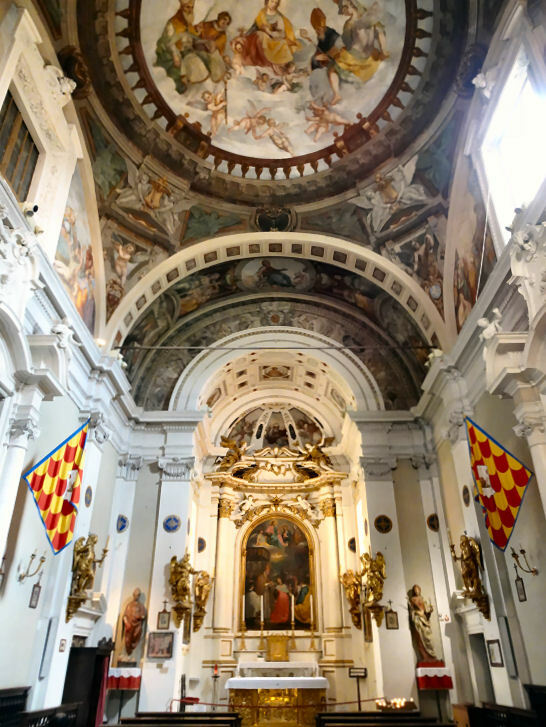 On side altars there are two paintings by Antonio Bonfigli from 1729 depicting the Martyrdom of St Catherine of Alexandria and the Madonna with Child and Saints. A damaged small triptych of the Madonna and Child by the Master of the Osservanza (Sano di Pietro?) is in the Pinacoteca. Also a Madonna of the Goldfinch by Sano di Pietro. 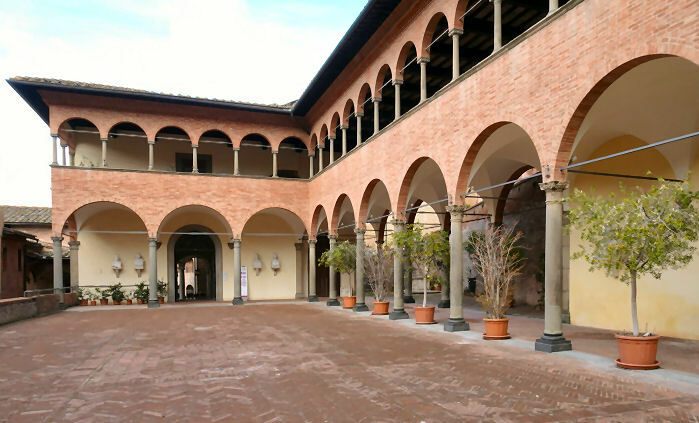 The convent was founded in 1329 by Milla Pannocchieschi d'Elci a noblewoman who, when widowed, decided to build a convent dedicated to Santa Marta following the rule of St. Augustine. Initially for widows only, then virgins. Milla died in 1348 but her family retained control of the convent. Suppressed in 1808 by Napoleon the convent became a prison and then, briefly, housed the mentally ill before they were transferred to the Asylum of Saint Nicholas. In 1814 the complex became an orphanage and remained so until 1975 when it became a college. It passed to the City of Siena in 1983 and in 1986 restoration work began. Now houses the Istituto Storico della Resistenza Senese e dell’Età Contemporanea archive and accommodation for rent. The original convent church now survives beyond the east end of the later, late 16th-century church. 14th-century frescoes remain on the right hand wall of the earlier church/ church choir. These include the Burial of Saint Martha by Matteo Giovannetti. There are also 14th/15th century monochrome fresco fragments in the cloister (see below) depicting the Life of Saint Jerome and the reclusive life generally. The refectory has a large fresco of 1522 of the Last Supper (found in 2004 under whitewash) by Giacomo Paccharotti, a colleague of Pintoricchio. Two panels from a polyptych by Ambrogio Lorenzetti, depicting Saints Paul and John the Baptist, are in the Pinacoteca. As is a sweetly impressive panel of Scenes from the New Testament (see right) by Niccolò di Bonaccorso. 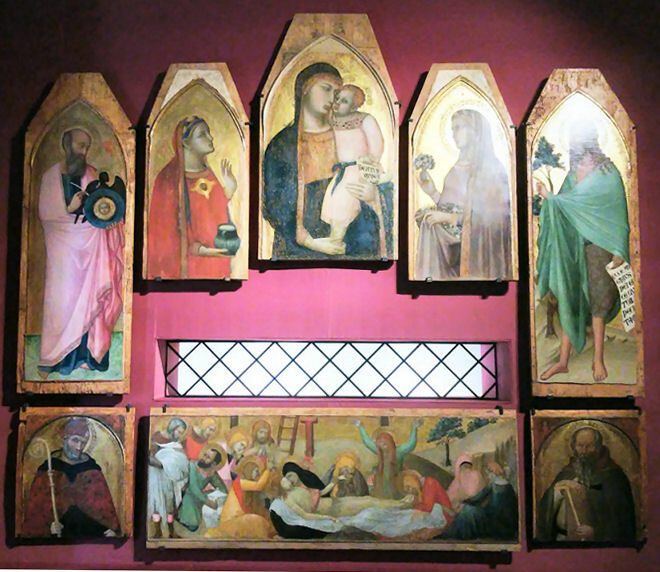 There are also panels of the Virgin and Child with Saints, in the Pinacoteca and other collections, attributed to a close associate of Simone Martini, which may be the remains of an altarpiece made for the 14th-century Augustinian community here. A cutting from an Antiphoner illustrated by the Master of the Osservanza around 1430/40 which was probably made for this convent is in the Fitzwilliam Museum in Cambridge (It. 12). The cutting, showing Saint Augustine sailing to Africa after his mother's burial, featured in the museum's exhibition 'Colour - the art and science of illuminated manuscripts' and the pigment analysis done at that time shows considerable differences from the works by Sano di Pietro that are in the museum, thereby casting doubt on his recent identification as the Master of of the Osservanza. 17th/18th century art by Giuseppe Nicola Nasini and Apollonio Nasini (last left) Francesco and Antonio Nasini and a framed altarpiece by Astolfo Petrazzi (middle left) A Raffaello Vanni Death of St Joseph in the frame in the first left chapel was restored in 1997 but is still dark. The only painting in right-hand chapels is a Coronation of the Virgin by Stefano Volpi on the wall in the first. Oratory within the former Institute of Santa Teresa complex commissioned by Monsignor Leopoldo Bufalini as a school for girls. Built in Neo-Renaissance style 1877-1885 to designs by Giuseppe Partini. The oratory has a wooden ceiling carved by Giorgio Badini. The high altarpiece is the Transverberation of St Teresa of Ávila of 1875 by Alessandro Franchi. The altar was sculpted by Leopoldo Maccaro. The ceiling has St Simon Stock Receives the Carmelite Habit from the Virgin also by Franchi (1884). Other canvases include the Prophets Elias and Eliseo, St Girolamo Emiliani, and a Santa Cecilia by Riccardo Meacci. Franchi also painted a Madonna del Carmine with Saints Agnes and Louis; Gaetano Marinelli (1835-1924) painted Saints Joseph, Bernardino, and Catherine; Giuseppe Catani painted a Santa Caterina delle Ruote; and Leone Leoncini painted St Vincent of Paul and St Thomas Aquinas and St Giuseppe Calasanzio. Originally a monastery which moved here in 1361, after the plague. 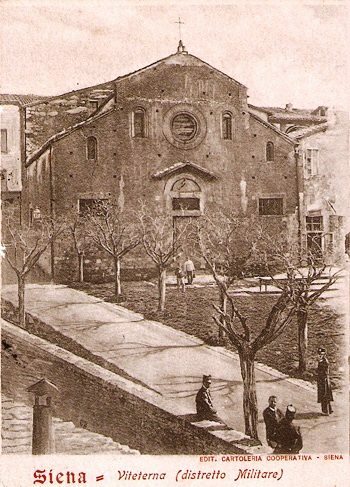 This original church, dedicated to San Paolo became too small and work on a new church begun in 1622 to designs of Flaminio del Turco. The brick façade, the work of Niccolò Franchini, was completed in 1678, The cupola, supported with an octagonal tambor, was completed in 1645, with the lantern reconstructed in Neoclassical style in 1818 by Agostino Fantastici after an earthquake in 1798 destroyed the previous one. When the monastery was suppressed by Napoleon the Contrada della Chiocciola moved here from the Chapel of the Madonna del Rosario nearby, along with the art and fittings from that oratory. 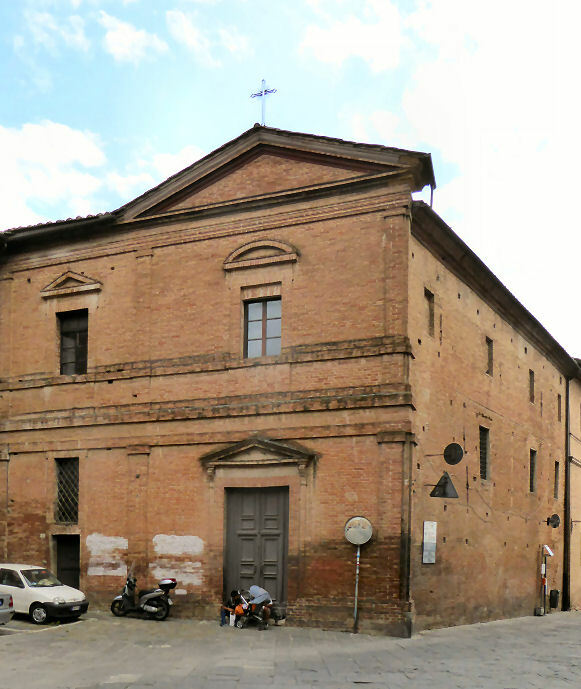 The church was then dedicated to Santi Pietro e Paolo. The interior has stucco decoration (1711) by Giovanni Antonio Mazzuoli. The high altarpiece is the Coronation of the Virgin with Saints (1520) by Andrea and Raffaello del Brescianino. Another altarpiece depicts the Death of St Paul by Astolfo Petrazzi. On the altar of the Rosary is a 15th-century Madonna and Child. 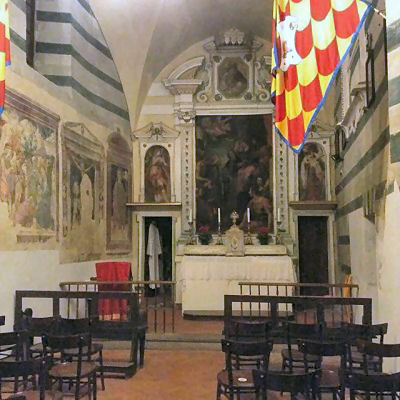 The crypt features a display of Palio victories. One of Siena's oldest, built on the site of a pagan temple. 17th century but with 13th century remainders, including the fine Romanesque portal. Contains paintings by Ventura Salimbeni and Francesco Vanni. Said to date from 1144. Renovated in the 18th century. Was the parish church until suppression in 1782 by Grand Duke Leopold of Tuscany and in 1788 it transferred to the Istrice (Porcupine) contrada. 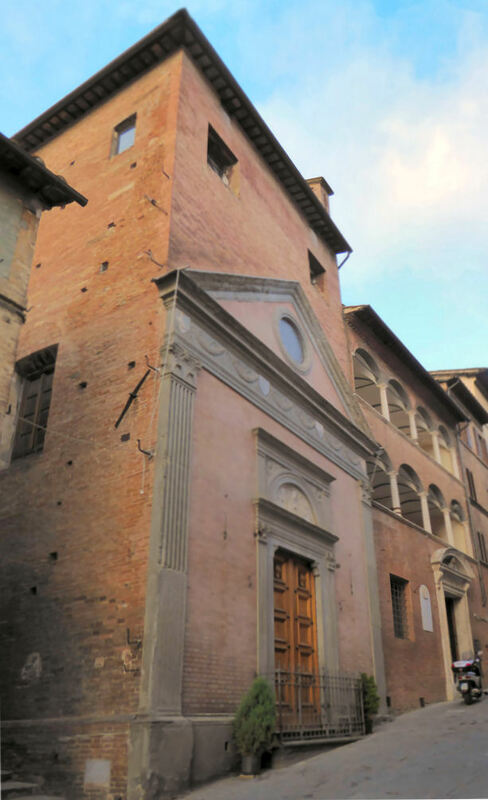 The painter Pintoricchio was buried here in 1513 - there's a small niche with a bronze bust on the right wall. 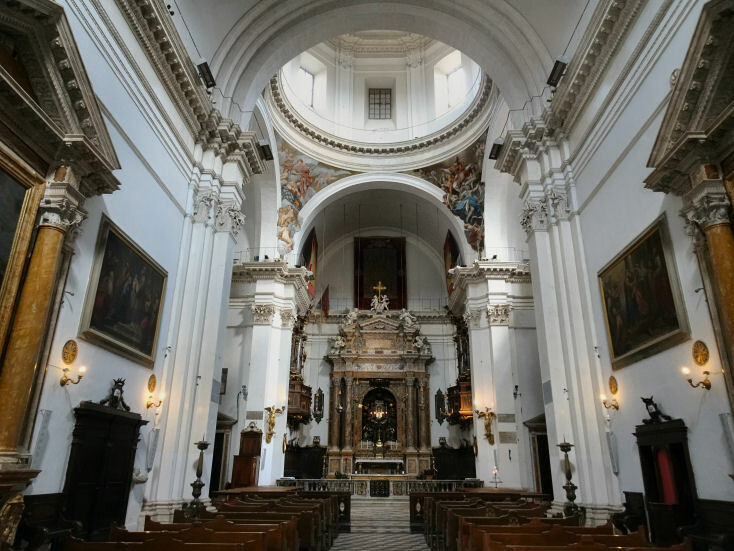 Baroque interior with a single nave and five bays. On left wall is a Madonna and Child with Saints Bernardino and Jerome by Sano di Pietro. Over the high altar is an 18th century wooden tabernacle with angels, behind which are 18th-century monochrome frescoes by Carlo Amidei. Contains much 18th-century art, but also an anonymous fresco of Christ Pantocrator detached from the façade which is early-13th-century and possibly the oldest painting in Siena. And is maybe no longer to be found here. Neo-gothic, high and handsome, rebuilt in 1871 as the original one had been damaged by an earthquake in 1869. Founded in the 14th century by Benedictine Sylvan monks and then to fellow Benedictine Vallombrosan monks. 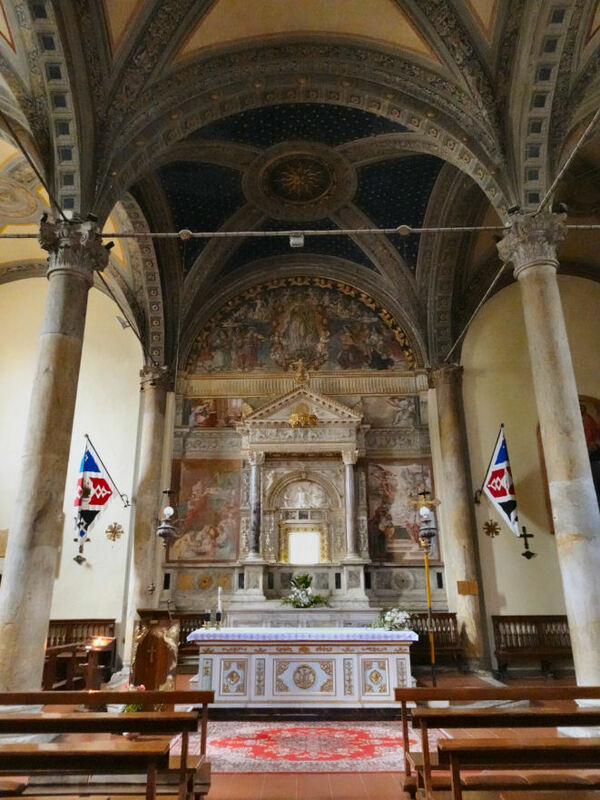 In the mid-15th century it passed to Observant Dominicans who undertook major rebuilding from 1498 to 1530, financed by Pandolfo Petrucci, resulting in the church we see today. The convent was suppressed in 1848 and became a prison. The church later became a parish church. 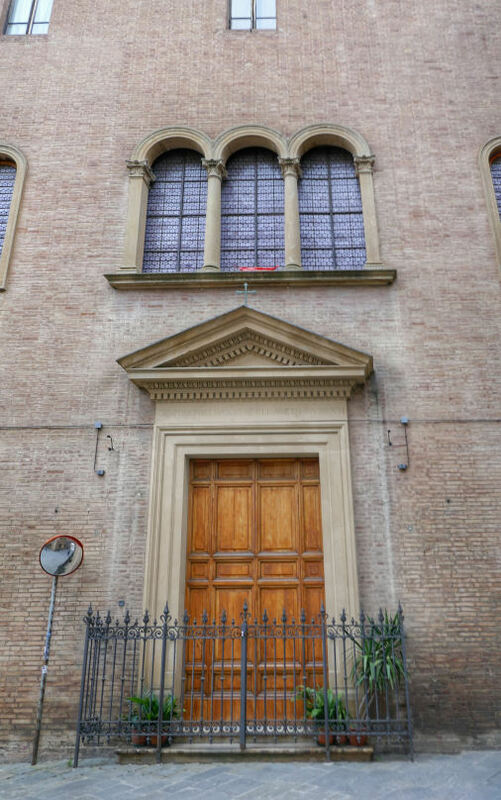 The brick façade has a Renaissance doorway attributed to Baldassarre Peruzzi and dated 1519. An aisleless nave with four chapels on each side. The transept is slightly protruding while there is a deep choir with an apse. The dome is equipped with a drum and is attributed to Giacomo Cozzarelli (1508). First chapel on right (the Spagnoli) entirely frescoed by Sodama in 1520 (1530? ), including a Saint Jacob of Compostela Defeating the Moors, a very Spanish subject in a chapel commissioned by Spaniards. Also in this chapel is a 1504 polychrome terracotta Nativity by Ambrogio della Robbia, the Dominican of the more famous Andrea. The third chapel on the right formerly housed the Coronation of the Virgin by Domenico Beccafumi mentioned in Lost art below. Further down on right, the transept chapel before the high altar has San Giacinto in Glory in the vault by Francesco Vanni, with the saint's life depicted by Ventura Salimbeni on the walls (The Miracle of St Hyacinth by Ventura Salimbeni c.1600). (or In the right transept is an altarpiece with the Miracle of St. Hyacinth by Francesco Vanni (before 1596), surrounded by frescoes by his half-brother Ventura Salimbeni with Saint Hyacinth returning the sight of a boy on the left) and Saint Hyacinth walking on the water to the right). 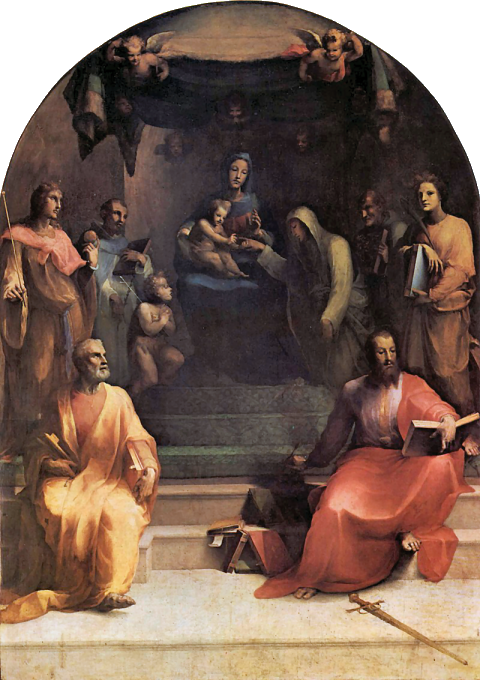 The Borghesi altarpiece by Giacomo Pacchiarotti of 1505, although the predella is in the Pinacoteca. A Coronation of the Virgin by Girolamo del Pacchia from 1513/14 for the chapel of the Balisteri family. 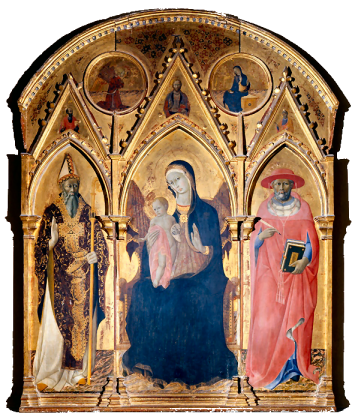 A late 14th-century panel of the Virgin and Child Enthroned with a Donor by Andrea Vanni, now in the Diocesan Museum. The Mystic Marriage of Saint Catherine of Siena by Domenico Beccafumi (see right) that was painted for the Dell'Orafo chapel c.1528, and noticed there by Vasari in 1538/39, is now in the Chigi-Saracini. 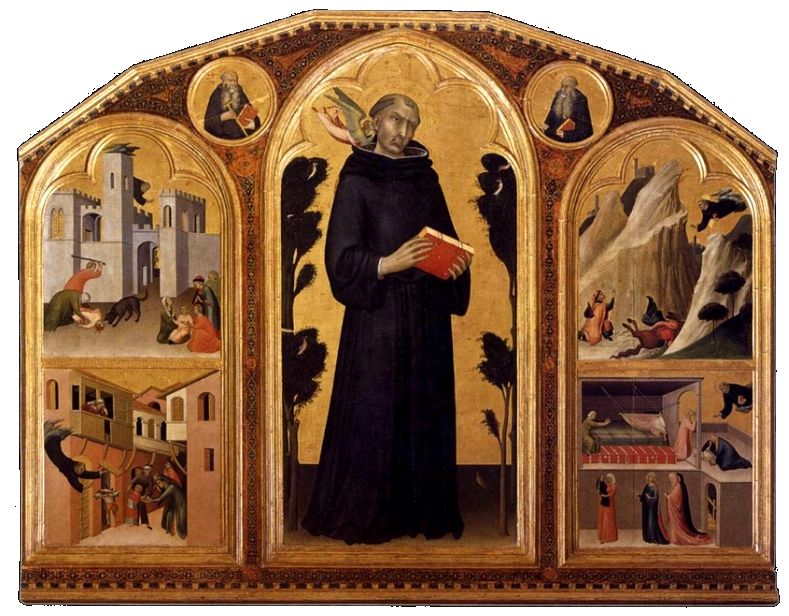 There are predella panels - two each in the Philly Museum in Tulsa, the Museum of Fine Arts in Boston and in the Getty Museum. Another Beccafumi The Coronation of the Virgin of 1539 came here from the convent of Ognissanti when that church was destroyed. It recently moved to the Pinacoteca. Founded in the 12th century and rebuilt baroquely in 1675. Formerly falling into dereliction, the church is now used for opera performances. Housed the Madonna and Child with Saints (including Saint Stephen looking even more like Mickey Mouse than usual) (1400) by Andrea Vanni (with a predella by Giovanni di Paolo of six scenes from the Life of St Stephen with a central Crucifixion with Saints Jerome and Bernard) which is now in the Duomo Baptistery. As is a Visitation by Rutilio Manetti formerly on the the right hand altar here. 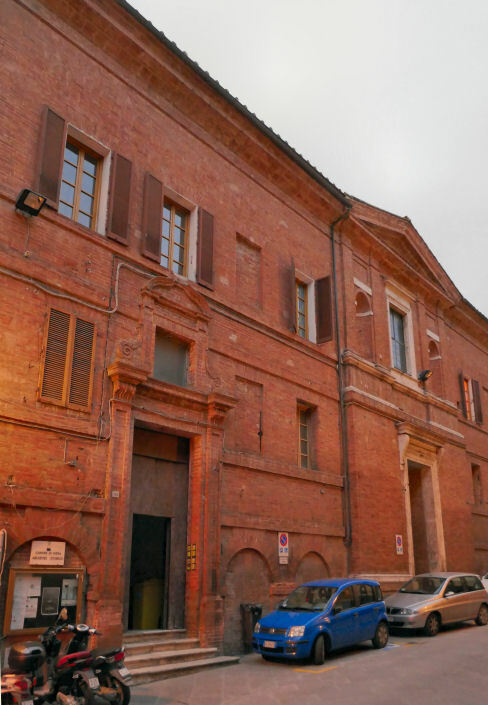 Founded by Augustinian nuns in 1362 and rebuilt in 1577 by Annibale Bichi, this is the most substantial remaining part of the the adjacent convent of Santa Maria degli Angeli. The name Santuccio derives from the fact that the major benefactors were members of the Santucci family. Following suppression at the end of the 18th century the church became a refuge for nuns from other monasteries. At the beginning of the 20th century the monastic buildings became a professional college. The church and ex-convent buildings now occasionally host exhibitions. The white and gilt interior houses an altarpiece of the Madonna and Child with Saints begun by Francesco Vanni in 1610, the year of his death, continued by Ventura Salimbeni, his half-brother, who died in 1613, and completed by Sebastiano Folli in 1614. Either side of the altar are a pair of panels entitled The Concert of Angels signed by Ventura Salimbeni and dated 1612. The frescos on the side walls are also by Ventura Salimbeni, and depict six episodes in The Life of Saint Galgano, a local saint whose head the nuns long kept in a silver reliquary, now in the Museo dell'Opera del Duomo. A 12th-century oratory, later passing to the canons of San Martino. Abandoned after suppression by the Grand Duke of Tuscany Pietro Leopoldo. For a time it returned to use, but by WWI it was in a state such as to be used as a grain store. Demolished in 1936 and now commemorated in the name of a piazza where it was sited. A superior Duccio-like Crucifix by an anonymous master is no.21 in the Pinacoteca. 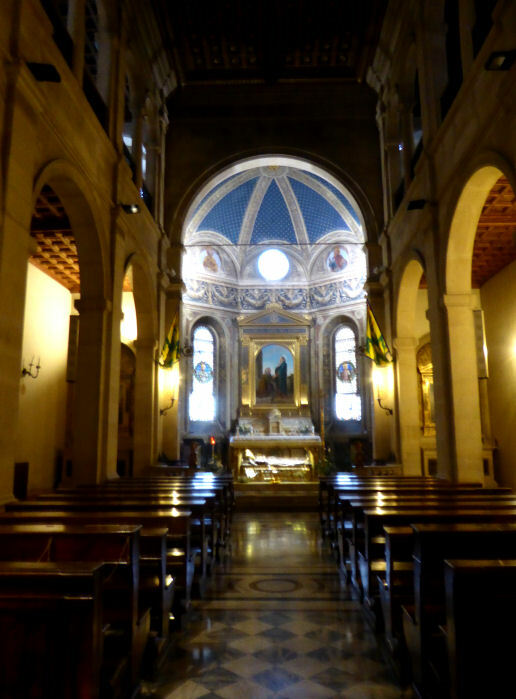 A church first documented in April 1064, with the church name vulgarised as Sant'Amorici. A parish church through the Middle Ages, it was deconsecrated in 1785, sold to a cooper and used as a warehouse. Only the façade, with the pillared doorway and a rose window, remains as the side of a house. The Mannelli chapel had an altarpiece painted by Paolo di Giovanni Fei in 1391, pieces of which, depicting Saint James Major, Saint John the Baptist, and Saint Mauritius, are now in the Pinacoteca. Also by him and in the Pinacoteca, a Birth of the Virgin of around the same date, and clearly influenced by Pietro Lorenzetti's version of the same scene now in the Duomo museum. A high altarpiece from the mid-1340s by Niccolò di Segna. The central panel, of the Virgin and Child, is in the I Tatti collection. The four main lateral panels are in Baltimore (Saint Lucy), Atlanta (Saints Maurice and Catherine) and the Pinacoteca (Saint Bartholomew). 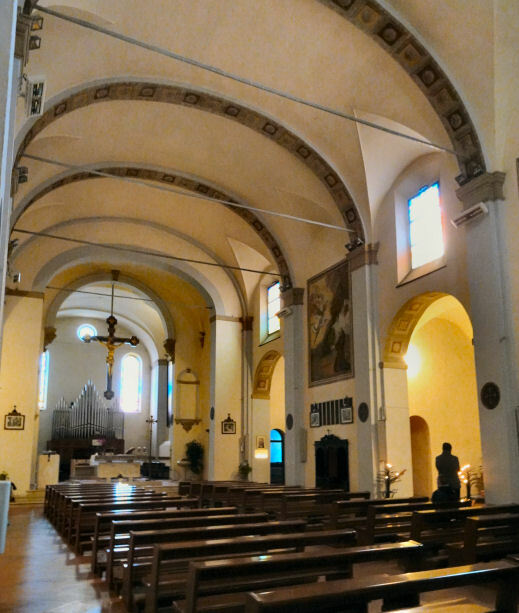 Smaller panels from the clerestory level are widely dispersed, the pinnacles and predella panels are lost or unidentified. A Master of the Osservanza (Sano di Pietro?) 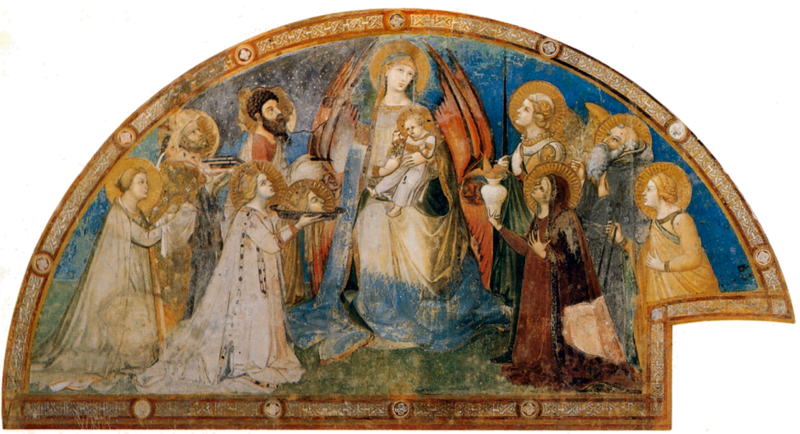 triptych of the Virgin and Child with Saints Ambrose and Jerome (see right), called the San Maurizio altarpiece, dated 1436 and commissioned by merchant Manno di Orlando for his chapel here, is now in the Osservanza, with its predella in the Pinacoteca (no.230). The monastic complex founded here by the Vallombrosans at the end of the 12th century, was already crumbling by1490. After the siege of 1555 Clarissan Franciscan nuns were forced to leave their then home outside the Roman gate, occupied by the Spanish/Florentine troops, and on March 29, 1556 the abbot of San Giacomo and Filippo (as this complex was then called) was instructed to leave the monastery so that the nuns could move here. But the first stone of the rebuilding was not laid until September 17th 1577 with the nuns finally moving in on 28 October 1596, with the complex then taking the name of Santa Chiara. They remained until 22 July 1818 when the complex passed to Olivetan monks and was renamed the Ospizio di San Benedetto in Santa Chiara . The Olivetans left the ospizio on the 7th of July 1866, when the monastery was suppressed. After a failed project to turn the complex into prison, by 1872 it had been adapted to house a military barracks. Very little remains, apart from the cloister, the church having been mined by the retreating Germans on 2 July 1944 and almost completely destroyed; but for two walls on which there's a plaque. An early 13th century Sienese Crucifix (with a still very triumphant Christ) is in the Pinacoteca. An Enthroned Christ with the Virgin by Rinaldo da Siena, a recently-identified contemporary of Guido da Siena. He was formerly, and sometimes still is, known as the Master of the Clarisse. The Breviarium fratrum minorum (Cod. X.IV.2) a manuscript in the Siena Biblioteca Comunale of c.1430/40, has a calendar by Sano di Pietro. 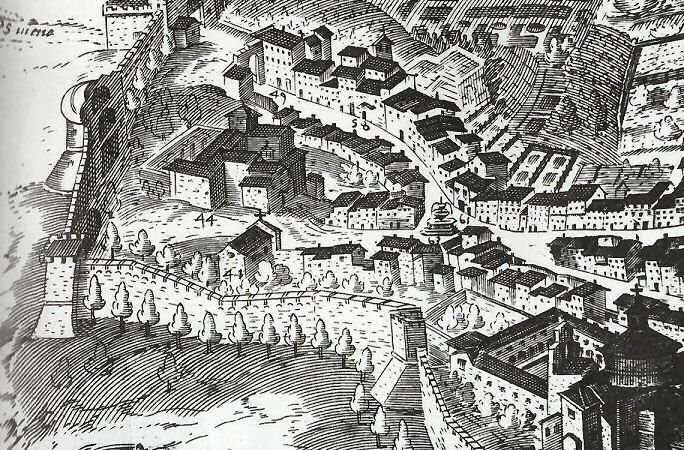 The Santa Chiara complex on Francesco Vanni's map of 1595. Saint Peter Enthroned with six New Testament scenes by a follower of Guido da Siena, or maybe the man himself, is no.15 in the Pinacoteca. The argument that it's not by Guido himself is based on it being too good. Giovanni di Paolo was buried here in the chapel of Saint John the Baptist in 1482. 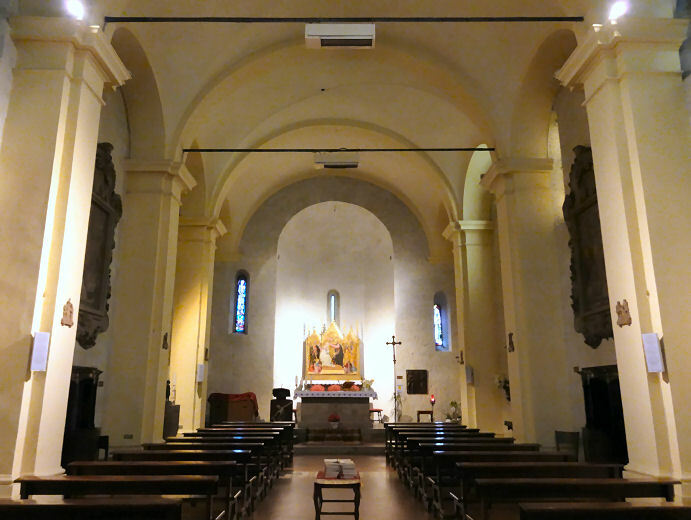 The church here was originally the church of the Umiliati and called San Tommaso. Franciscans nuns who had founded, on a different site outside Porta Camollia, a convent dedicated to Santa Petronilla in 1219, where forced to move out in 1553 when the besieging of the city by the Habsburg Emperor Charles V and his Florentine allies lead to the demolishing of their complex and their moving inside the walls. The nuns eventually, in 1571, acquired San Tommaso and its convent buildings - the Umiliati having been suppressed - and renamed it. 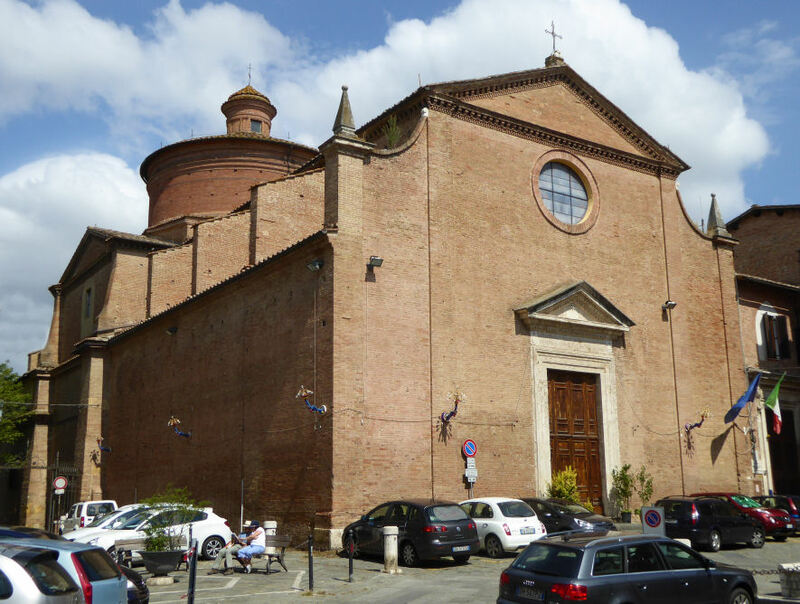 It became known as Santa Petronilla degli Umiliati until it was suppressed by Napoleon in 1810. 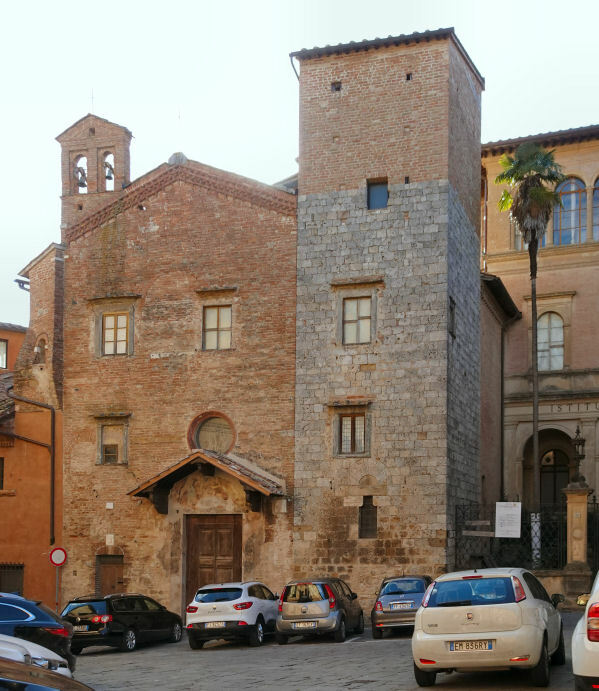 The church and most of the convent was demolished in the late 19th century, but the remains of some of the convent buildings remain on the south and west side of Piazza del Sale converted into private residences. A vivid and very Byzantine panel of Saint John the Baptist Enthroned, with 12 scenes from his life, by a 13th-century Sienese master is in the Pinacoteca. Also a Polyptych of the Assumption by Sano di Pietro.